GOVERNMENT has revived its bid to regulate consumption of alcohol with a Cabinet committee recently approving a draft policy outlawing sale of alcoholic products during certain days, hours and to pregnant women. 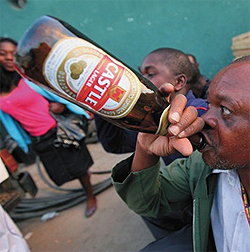 It has been gathered that the National Alcohol Policy has since received blessings from various line ministries and is set to be tabled in Cabinet anytime soon. The push to enforce a host of restrictions on the sale and consumption of alcohol follows Government’s concern over increasing cases of abuse of the product countrywide. The policy is a brainchild of former Health Minister Dr Timothy Stamps, who is now health advisor in the Office of the President and Cabinet. Dr Stamps argued the policy is the right pathway in maintaining good health as well as protecting people against alcohol abuse. Health and Child Care secretary Retired Brigadier General Dr Gerald Gwinji said the proposed new rules are similar to those first mooted in 2010. “We took the proposed new policy to the working party which comprises officials from various ministries and it passed,” he said. “It also went to the Cabinet Committee on Social Services and Poverty Eradication and it went through. It now awaits to go to the Cabinet. “The current one is a revised version of the 2010 draft after realising that the initial one had gaps. “The policy is concerned with imparting behaviour change. Our Harare Bureau understands that the policy proposes to bar the sale of alcohol during the week, regulate the number of hours to sell the products and provide guidelines on the consumption of alcohol during special events like parties and weddings on the basis of the venue in which they are held. Information shows that motor vehicle drivers found with a blood alcohol concentration of above 0,08 per 100ml of blood face arrest and those found selling the product to pregnant women will also be arrested.